Apple has released the third beta version of iOS 9.2 to users participating in the Public Beta and Developer Beta testing programs, alongside tvOS 9.1 beta 2. The new iOS 9.2 release arrives as 13C71 and continues to support iPhone, iPad, and iPod touch, while tvOS 9.1 beta 2 shows as build 13U5069b. 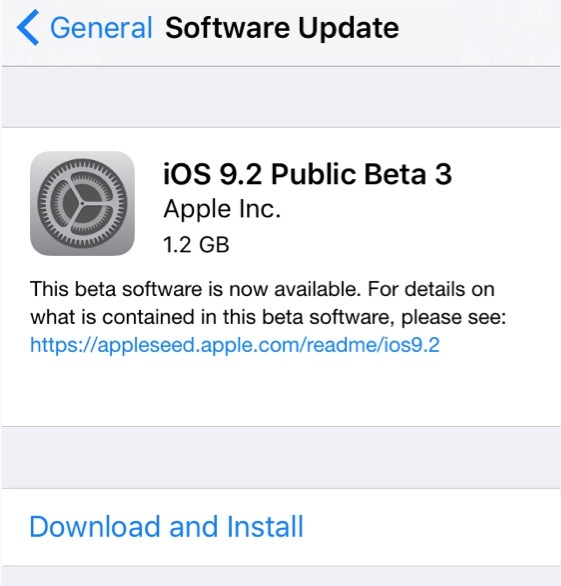 Users running a prior version of iOS 9.2 beta can find beta 3 available now from the OTA download mechanism on their devices, found in Settings > General > Software Update. The download weighs around 1.2GB. Apple TV 4th generation users running the prior tvOS beta can also download 9.1 beta 2 from Over the Air via Settings. Both beta releases can also be downloaded from the Apple Developer center and installed manually through firmware and iTunes. Presumably both beta versions of tvOS and iOS 9.2 focus on bug fixes and feature refinements. Separately, Mac users in the beta testing programs will find OS X 10.11.2 beta 3 available for download as well.